AleaSoft, October 31, 2018. In October, the Spanish electricity market stopped a price race of six consecutive months. 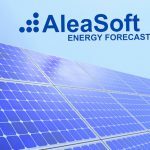 According to AleaSoft, the main causes are the decrease of the price of gas and coal, and of the CO2 emissions rights, and, obviously, the suspension of the tax on the generation of electricity and the exemption of the special tax on hydrocarbons. The month of October 2018 closed with an average price of 65.08 €/MWh in the Spanish electricity market MIBEL, and 65.38 €/MWh in the Portuguese market. This price represents a price reduction in the Spanish market of 6.20 €/MWh compared to the month of September, and represents the first price decrease in the last six months, from the month of March of this year, in which the price did not stop climbing month after month. 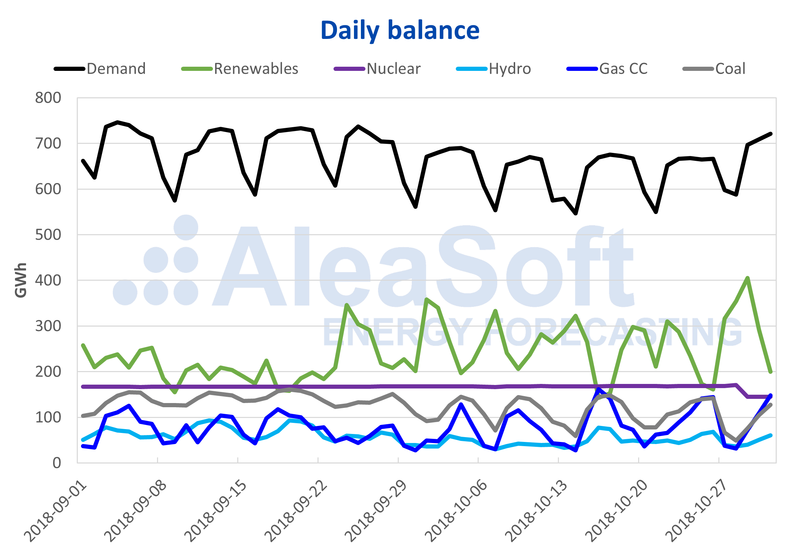 The main causes of this change in price trend, according to Aleasoft, are the relaxation of fundamental variables such as the price of gas and coal fuels, and the price of CO2 emission rights. Another factor that has impacted the behaviour of the price this month has been the publication of the Royal Decree-Law 15/2018, which temporarily suspends the 7% tax on electricity generation and includes an exemption for the hydrocarbons tax known as the “green tax”. The approval of this Royal Decree-Law at the beginning of the month implied a reduction of the electricity market price between 5% and 6%, according to AleaSoft calculations. The month of October that just finished began with a drop in temperatures after the hot summer, which caused a drop in electricity demand of 6% compared to the last days of September. During most of the month, temperatures were around the usual temperatures for this time of year. The month ended with the cold snap caused by the arrival of a mass of Arctic air that caused a sudden fall in temperatures on the last weekend of the month, and an increase in demand of 7.1%, according to the AleaSoft analysis. Overall, demand in October was 1.8% lower than in September, and 1.0% higher than in October 2017. Source: Prepared by AleaSoft using data from REE. The production of electricity with renewable energy sources during the month of October was characterised by the recovery in wind energy production, which, after a summer with very low levels, increased in October by 73.6% compared to September. On the other hand, solar energy production decreased by 23.3% compared to the previous month, due to the decrease in sunlight hours. In addition to the cold snap and the increase in demand, the month of October ended with the shutdown of one of the reactors of the Almaraz nuclear power plant on October 29, which is not expected to restart until December 2. This decrease in nuclear availability will not help to lower the market price during this month of November, although AleaSoft forecasts indicate that if the trend in the price of fuels and the CO2 emission rights continues to fall, the price of the electricity market will also fall in November. During this week of October 29, prices in the rest of the main European markets continued in the same trend as the previous week. 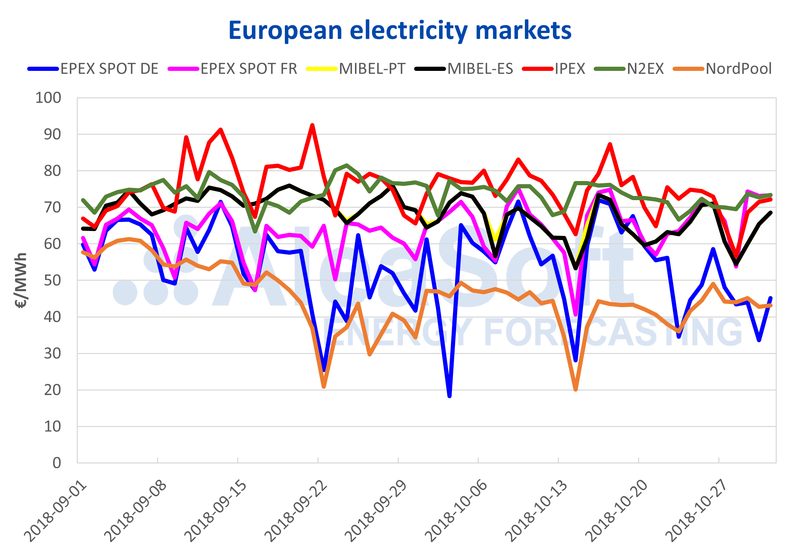 Most markets grouped around 70 €/MWh, those are the Spanish and Portuguese MIBEL market, the French EPEX SPOT market, the Italian IPEX market and the N2EX market in Great Britain; while the German market EPEX SPOT and the Nordic NORDPOOL remained the cheapest, between 40 and 50 €/MWh. Source: Prepared by AleaSoft using data from OMIE, EPEX SPOT, N2EX, IPEX and NordPool. 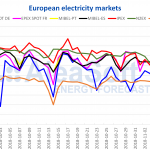 Electricity futures in the Spanish market OMIP for the first quarter of 2019 continue its downward trend. This week, the price dropped by 2.7% compared to last week. The price of futures for the year 2019 continues relatively stable, fluctuating between 60 and 61 €/MWh. On the other hand, electricity futures in France and Germany for 2019 fell by 4.1% and 4.8% respectively, placing the German future below 50 €/MWh for the first time since the beginning of September. According to AleaSoft, the drop in the price of gas and CO2 emission rights would be among the main causes of this drop in futures prices for next year. CO2 emissions futures for December are now approaching 15 € per ton. On Friday October 26, they settled at 18.28 €/t, and yesterday, October 30, they were already at 16.02 €/t. European gas futures, like the previous week, continue to fall, this week by 3.9% compared to last week. On the other hand, European coal futures continue at around $100 per ton. Yesterday, October 30, the futures for January settled at 97.85 $/t.